The big plus with the bass pedal cajon is that it's the only model that doesn't require you to stop playing with one hand in order to change the snare sound. Although it might take a little practice to get used to operating the pedal, the rewards will be more than worth it. Significant increase in volume and bass tone. Ability to change the sound while playing with both hands. It won't fit in any of Meinl's standard bags, although a dedicated deluxe bass pedal cajon bag is available. Meinl snare cajon: From the world percussion range. A rubberwood body with a soundhole positioned at the rear. This cajon stands 51cm tall (including the feet). The bass pedal is a 5cm steel protuberance. Meinl's snare cajon is from the company's ever-expanding world percussion range. Like many of Meinl's cajons, it has a resonating rubberwood body and a soundhole positioned at the rear of the instrument opposite an ebony frontplate or 'tapa'. The frontplate feels great under your hands. Its smooth and beautiful vertical grain finish felt as though it could take quite an aggressive playing style while also displaying a responsive and highly sensitive side at lower volumes too. This model features Meinl's unique recessed padded sitting surface and four chunky rubber feet, so you can be safe in the knowledge that the cajon won't slide about or tip over easily. This helps during performance too, as one of the traditional ways of playing a cajon is having the front just up off the ground and resting on just the back two feet. It also offers an easier playing angle and, when alternating between playing with two feet or four feet down, will be beneficial for your back too. One of the first things you'll notice about this cajon is that it has enlarged dimensions compared to Meinl's standard cajons. It stands 51cm tall (including the feet) and is 34cm wide and 35cm deep. This super-sized model sounds deep and resonant. Even when played unamplified it kicks out a really impressive bass tone, which blends perfectly with the open tones and slaps when you play towards the top edges. You can also produce lovely full tones on the sides of the cajon. As with any cajon, the beauty of discovering these new sounds and experimenting is really part of the fun of playing this unique instrument. The bass pedal referred to in the name is a 5cm steel protuberance situated on the bottom left-hand side, as you sit at the instrument, and this moves back and forth to operate a sprung mechanism that connects to some snare wires at the top half of the cajon. This model features a fully adjustable and impressively sturdy internal snare mechanism which utilises no less than 48 strands of snare wires, which are cut and left to hang free at one end. These are further supported by a length of Velcro-esque material that prevents the snare wires from rattling when they are in the 'off' position. This simple idea works extremely well, controlling the level of snare sound beautifully and providing sizzle and bite as the snares come into contact with the inside of the frontplate. The best thing about this cajon is the option of having no snare, just the slightest hint of snare and then gradually more and more until you have a full-on tight snare response. As you push down with the back of your foot on the pedal the snare wires move accordingly and, with a bit of practice, you'll be pedalling like a pro in no time. There is also a sturdy wooden vertical support post inside the cajon, which helps provide extra integral strength to the cajon and overall the construction seems solid and reassuringly durable. At first it seemed this model might be better suited to louder contemporary or electric settings - and it certainly did produce some amazing results when amplified, but due to the larger-than-average dimensions, it was just as well suited to acoustic settings. When correctly miked, however, the bass pedal cajon sounds huge. When amplifying a cajon, you normally position a mic to the rear of the instrument angled toward the soundhole, and with the bass pedal cajon you can achieve a titanic bass kick with very little effort at all. We got some great results from overdubbing on a recording recently, by using a second mic aimed at the top edge of the tapa. The engineer was able to get exactly what he wanted from the combination of the two positions and thankfully, everyone was smiling with the results. 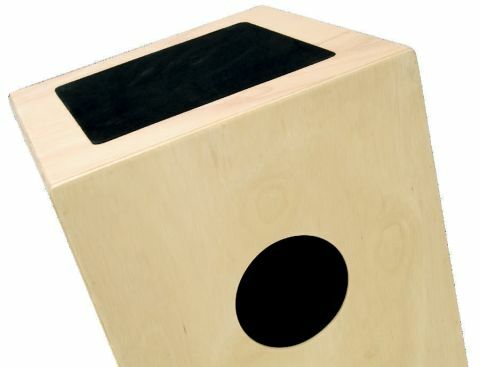 The bass pedal cajon is one of Meinl's most ground-breaking models in terms of design. One slight criticism is that as the cajon is considerably bigger than previous snared models, it will not fit into either of the existing cajon bags - although new dedicated deluxe bass pedal bags are available. It is still a really lightweight instrument however, and the larger size shouldn't pose any problems when it comes to carrying the instrument in one hand or over your shoulder in one of the new bags. Meinl already produces one of the largest range of affordable, durable cajons with many different sounding frontboards as well as snare or guitar string versions. This newest addition to the range expands on these models and introduces some interesting new ideas that offer the percussionist many choices.